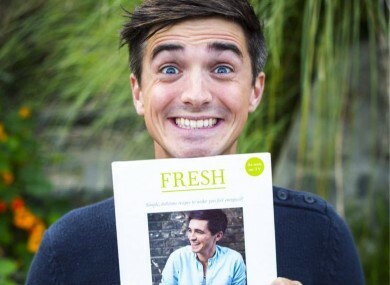 One of the nominated authors, Donal Skehan. IF YOU’RE LOOKING for a great book by an Irish author, this latest shortlist for the Irish Book Awards is for you. It’s the 10th year of the Bord Gáis Energy Irish Book Awards, and this year’s shortlist features a diverse array of acclaimed Irish authors across a range of genres for adults and children. TheJournal.ie is delighted to sponsor the Best Irish Published Book of the Year category, where the nominees include Jennifer Goff and Sinead Gleeson. The titles were chosen from hundreds of books submitted for consideration. You get your say too – from today, the public can cast their vote on the best books via the awards website. Last year, over 45,000 readers and book lovers voted to select the winners. Votes can be cast until midnight on 20 November 2015 and the winners will be announced at a gala event in Dublin’s Double Tree by Hilton Hotel on Wednesday, 25 November. The awards have gone from just three categories in 2006 to 13 today. The highlights of the show will also be broadcast on RTÉ. Throughout the 10 years of the Bord Gáis Energy Irish Book Awards, one thing has never changed and that has been the seemingly limitless creativity of Irish writers. The Awards were set up to honour such creativity and it is our hope that we’ve played our part in showcasing the work of so many talented writers over the years. Over the next few weeks, TheJournal.ie will be highlighting the work of some of the authors in our Best Irish Published Book of the Year category. He recently wrote in the Sunday Independent about how his nominated book Fresh was inspired by being burnt out after a very busy year. It’s the first time I’ve ever talked about something that is quite personal, and it was actually liberating in a sense because I suppose everyone sees me as a happy-go-lucky guy with lots of energy, which I am generally, but you also have to realise there’s downsides to all of the work that we’re doing. He still has his Irish cooking series, UK Food Network series and RTÉ Reality Bites documentary show all to be launched in the coming months – so there’s no sign of him slowing down. But to avoid burnout, Skehan now gets up 90 minutes earlier than usual in the morning and has a good breakfast every day, and his healthy recipes inspired Fresh. Younger readers are the best readership as far as I’m concerned, but also if you look at the strength of the shortlist there – John Boyne, Eoin Colfer, Sarah Crossan – you’re talking about just brilliant, brilliant, brilliant books. For me it’s a joy, but it shows the strength of children’s books now. Email “These books are fighting to be named the best in Ireland”. Feedback on “These books are fighting to be named the best in Ireland”.